If you intend to plan every moment of your life the DailyTacker app is the best solution for your iPhone. It’s a wonderful organizer for your everyday life as in personal part as well as in business part of it. DailyTracker allows you to note such things as your habits, goals, illness, medication, food allergies, expenses, earnings, memories, news, and time spent on projects and much more that might have pace in your life. You can also stay up-to-date with the latest RSS feeds on your phone. The pp allows classifying the information you note by the trend charts in order to find quickly and easily what you’re looking for. The other feature that this app acquires is the ability to add voice memos to tasks. This app can serve you as some kind of reminder or necessary data server. 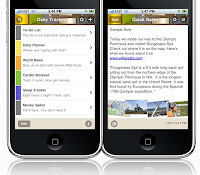 Anyway by DailyTracker you will undoubtedly always be organized will never miss something that’s very important for you. The app is available at the iPhone App Store.